The National Cerebral and Cardiovascular Center is a National Research and Development Agency, operating as one of the National Centers for Advanced and Specialized Medical Care in Japan. The hospital and research institute combine efforts to combat cardiovascular diseases, providing the most advanced medical services as well as conducting world-leading research and development. The National Cerebral and Cardiovascular Center, which was established in April 2014, had been running its own servers and facilities, but anticipated that the volume of data would rapidly increase, due to the fact that the Center would begin collecting and using information from medical institutions all around Japan. The Center planned to relocate all of its facilities by fiscal year 2018, and realized that using external services would make the relocation process smoother. Security was another factor. The ogranization concluded that using a trustworthy external environment would improve safety and security over managing servers on its own, and decided to migrate to a cloud infrastructure. To select a provider for building the cloud infrastructure, th Center ran an open proposal bidding process. The formulation of a cloud information security policy was included in the bidding specifications. In addition, the plan was to migrate the Cennter's entire network system to the cloud rather than migrating servers individually, so it placed greater emphasis on network flexibility, such as the number of VLANs, when selecting the infrastructure. 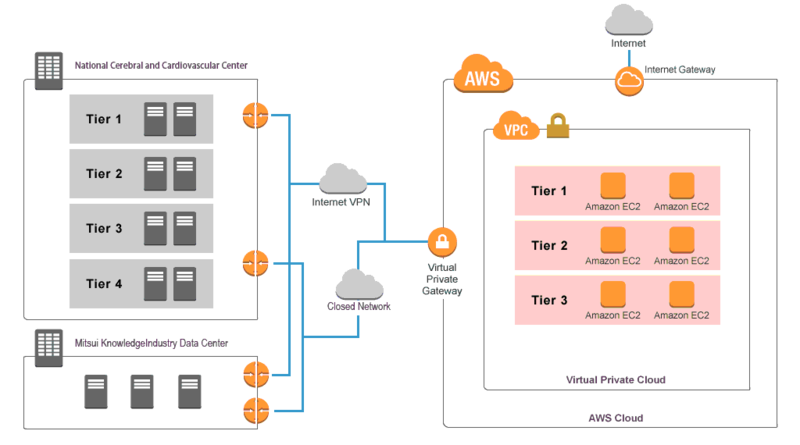 After a comparative review based on these requirements conducted by an evaluation committee, the Center decided to adopt Amazon Web Services (AWS) as the infrastructure that met all of its requirements. In AWS the Center built a monitoring infrastructure using Hinemos and a log management infrastructure using Logstorage, with support from Mitsui Knowledge Industry (MKI). After comparing the five-year operational costs, while taking into account the use of AWS Reserved instances, decision makers at the Center report that the costs of cloud use will be about equivalent to those of on-premises operations. But the security achieved from migrating to the AWS cloud brings signifigant additional benefits. The Center also believes the migration to AWS will improve operational loads on internal systems. It plans to continue to make the cloud a top priority for its public website, which collects data on cerebral and cardiovascular diseases. Ryo Haraguchi, assistant director, department of medical informatics, at the Center says, "Before installing the cloud infrastructure, we needed to undertake various technical studies and adjustments, as well as attending to security, governance, and contractual details. Considering the security and operational benefits over the long run, however, it has been worth the effort."